Best coaching institute of bank P.O, coaching, Bank clerk coaching, Ibps coaching, Nda coaching, Navy coaching, Scra coaching, Railway coaching, Ctet & Dsssb coaching. Crash courses & Weekend classes also available. We desire to make competition entrance exam preparation guidance affordable for those students Our teaching method not only assists you in grasping the basic core concepts but also focuses on increasing your speed and accuracy instead of mugging formulae We want you to understand the concept and follow the simplest possible approach, to solve the problems. 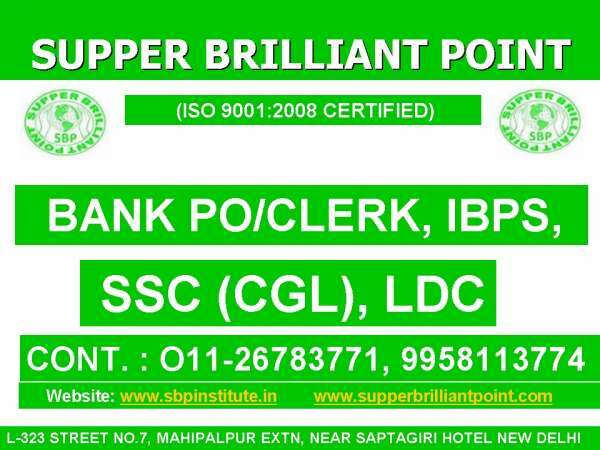 SUPPER BRILLIANT POINT IS THE BEST COACHING INSTITUTE. IT PROVIDES BEST QUALITY OF MANAGEMENT AND ENVIRONMENTAL MANAGEMENT SYSTEM TO BE ENSURED 100% COMPLETE SATISFACTION FOR THE STUDENT. Looking institute in delhi for bca from mgu?